Sun 17 Nominations for ERT Winter Season close. All ages and abilities, including High Performance Pathways. The Eastern Region Tennis Association grand finals were played on Saturday 23rd of March. 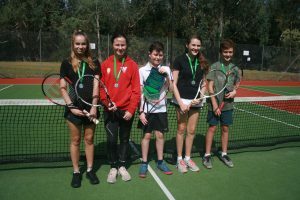 Healesville Tennis Club had one Junior team playing at home on the Saturday morning and one Senior team playing at home in the afternoon. Junior Open Singles/Doubles team were runners-up to Yarra Glen, 3 sets, 34 games to 5 sets, 39 games. (left to right) Stella Singh, Kaela Willemson, Tom Holloway, Sylvie Dyson-Taylor and Gideon Classon. 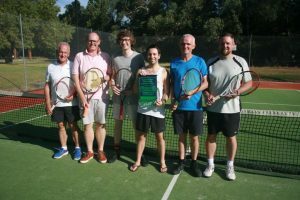 The Senior Open Section 4 team played East Camberwell and won the premiership by winning 3 sets, 42 games to 3 sets, 39 games, in a tight, high-standard match. (left to right): Michael Young, Keith Hughson, Tom Nolan, Matt Gillett, Mark Scully (captain) and Ross Honeycombe.